Experienced trio Katherine Brunt, Heather Knight and Anya Shrubsole have been named in the England squad aiming to retain the Ashes in Australia. All three missed the recent tour of the West Indies through injury but are available for the Australia trip. The multi-format series opens with a Test match in Perth on 10 January before three one-day internationals and three Twenty20 games. England won the home Ashes series convincingly during the summer. All-rounder Arran Brindle also returns after missing the Windies tour for personal reasons. England and Wales Cricket Board head of England women's cricket Clare Connor said: "We are pleased to welcome three of our most senior players back to the squad for what promises to be a very competitive series against one of the strongest sides in the women's world game." Captain Charlotte Edwards will lead the side in all three formats. Lancashire bowler Kate Cross, who made her international debut in the West Indies tour, is included in the Test and ODI squad, with Kent's Natasha Farrant replacing her for the T20 series. Missing from the squad which toured the Caribbean are spinner Holly Colvin, who is taking a break from cricket, batter Tamsin Beaumont, all-rounder Laura Marsh and seamer Beth Langston. 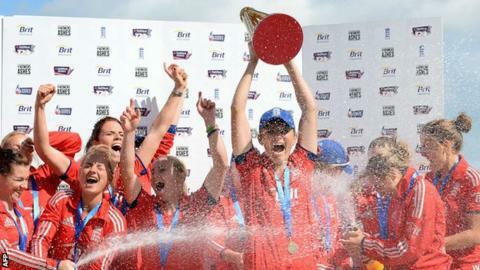 Connor added: "Last summer's series in England was watched by more spectators than ever before and the international women's game will gain further exposure this winter with all three T20 internationals being played as double-headers prior to the men's T20 fixtures." The multi-format series sees six points awarded for a Test win and two points for each ODI and T20 victory. England won the home series 12-4. Charlotte Edwards (Capt), Arran Brindle, Katherine Brunt, Kate Cross (Test and ODI only), Natasha Farrant (T20 only), Georgia Elwiss, Lydia Greenway, Jenny Gunn, Danielle Hazell, Amy Jones, Heather Knight, Natalie Sciver, Anya Shrubsole, Sarah Taylor, Lauren Winfield, Danielle Wyatt.